Recognizing the 100th blog on Silver Lining feels somewhat like watching my kids grow their first tooth – where did the time go? My awe also extends to the power of the internet and how the average citizen can literally reach the corners of the globe with their message. 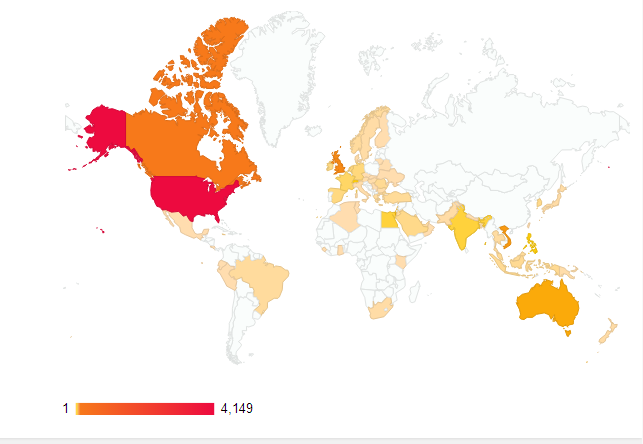 Readers from sixty-eight countries have logged on – I’m not sure I could even name sixty-eight countries if I tried. I won’t go into all my personal reflections on blogging – others have done so, and so very well. I echo their sentiments about the blessings and lessons in the endeavor, especially gratitude to those who read and support the blog (thankyouthankyou! Please don’t forget to share!). Instead, I’d like to focus on the blogs that I look forward to reading, which are my little treat when I can make the time. This is one element of the blogging experience that has been constant, and nothing but a source of pleasure, camaraderie and enlightenment (in contrast, sometimes, to the writing side…). I’m adding a page entitled “Favorite blogs” to commemorate and thank those writers. My only regret is not having enough time to explore new blogs to the degree I would have liked. My goal for the next 100 is to make sure I get out and read more blogs so I can have a much longer list when I hit 200. Frankoshanko – The most upbeat and positive person, ever! Ipledgeafallegiance – Well-written, sharp, funny political and social commentary. Imperfectly Balanced – A team of gals with a hilarious perspective on life, and who are great story tellers. Do they really do all that? Lady Romp – Women’s news. Helps me connect with my inner feminist (no, it’s not a dirty word) every day. The Other Side of Ugly – Without a doubt, the most affirming and uplifting messages about our humanity, and so beautifully said. Career Avoidance 101 – Really well-written career and personal management advice. The Seeker’s Dungeon – I’m not really that into poetry, but Sreejit has a way of beautifully stating a very human and poignant message. 30 Days to Health and Wellness – A great blog with tips for health (including recipes! ), wellness, and happiness. Blogging has been an opportunity for me to push myself beyond my comfort zone. First, I’m talking about my deepest fears and insecurities to anyone with an internet connection. Lately, I’m just talking about my ignorance. And what a vast topic that is. I have mentioned several times that, as a traditionally left-brained person, I have been exploring my right brain lately out of curiosity, novelty, experimentation, and even new-found respect. But for me, it’s fairly unexplored territory, though old, familiar ground for many of you. My latest foray into the right brain has been through the spiritual guide, Eckhart Tolle, and his book A New Earth. I’d like to start in a place of comfort and confidence, acceptance, before moving into the relative unknown, and that is coincidence. Tolle reiterates what I believe is one of life’s truths: that failure to accept reality, what is, is the source of suffering for self and others. For example, if we deny that gravity, taxes, or death exists, if we do not accept what is, then we will suffer. There are so many other truths in our lives, though perhaps less evident, that we also fail to accept and therefore create suffering. We fail to accept that we are not perfect, merely human. We fail to accept that we cannot control our environment or other people. We fail to accept that we have to take responsibility for ourselves, our own feelings and our lives. We fail to accept that we can choose our perspective, and therefore, happiness and peace over stress, anger and resentment. We fail to accept that we can take action or speak out, and use our power instead of feeling powerless. We fail to accept that life on earth is precious, and should be protected and treasured. Here’s where I’m less certain. Tolle states that everything that happens is meant to happen, because it did happen. There is also what appears to be the magic of coincidence when we are in an acceptance mindset. According to Tolle, when we are not accepting what is, we are creating resistance within, which creates resistance from the universe. Events and circumstances do not “cooperate” when we are in resistance mode. When we release resistance and become open, then the universe opens up, coincidences happen, events become favorable, and our paths open up. Part of acceptance, according to Tolle, is detaching from our Ego identity* (I call it the left brain). When we do so, then we can access our connection to the unmanifested – the energy that unites all lives and matter in the universe. I call that the right brain. I have found through an informal and decidedly unscientific survey that most people believe that there is no such thing as coincidence – often referring to fate, divine intervention, or something along those lines. I believe it is some spiritual version of “when one door closes, another opens.” I have found that, in my personal experience, this addage to be very true. I also know that when we are in an open, unresisting, accepting mindset, that we are able to notice and take action when that new door opens. Sometimes that connection is not even remotely subtle… but maybe that’s just coincidence? If we are closed, then we do not notice the open door, and an opportunity is lost. In other words, if our Ego is tied to a certain identity or path, our true path will not be evident to us since we are closed to that option. Our true path is communicated to us through our right brain, through our Being, not out Ego. So, please forgive my amateur reflections on this subject. I am in acceptance mode regarding my ignorance and am open to the wisdom of others. And the wisdom will come. It always does. Eventually. She’s opinionated, needs to feel right, needs to feel safe and protected, needs to defend herself against the world, needs to feel separate and independent, needs to feel good about herself, needs to feel righteous and virtuous, needs to believe she can figure out anything by just thinking it out, needs to defend herself when feeling attacked or blamed, needs to judge everything and everybody. World: meet my left brain, my Ego. Sad really. I have always been so proud of my analytical, left brain. It helped me do well in school, solve complicated problems, allowed me to have an intelligent conversation on a (limited) range of subjects, helped me manage a complicated schedule. Served me well. Still does. But something has been left out in the cold, and that is my entire right brain and sense of who I am separate from my identity. My joy and my bliss. Please forgive me since I am still a neophyte in this area, and am truly just learning about the 50% of my brain (and much of my self) that I’ve ignored and belittled for most of my life. In my infinite left brained wisdom, I finally realized, “well what happens if I used my WHOLE brain, rather than just one side of it?” Some of you might call that an Aha moment. Others, a du-uh moment (or really: du-uuuuuh). Earlier I wrote about Eckart Tolle’s concept of the Ego, and how the Ego (also the left brain) provides for each of us the sense of who we are, what we believe, and our identity not only to ourselves but to the world. This Ego has us feel separate from others, but also has a need to feel superior in some way – whether it is to feel right or righteous. It is human nature and collective sickness, according to Tolle, that we feed the Ego and encourage these tendencies. It is our journey and our challenge to re-discover our conscious awareness of self without the Ego. That conscious self is living in the present moment, is in tune with the connection between us (that we are all one, not separate), and observes the egoic mind without feeding the thought or emotion behind it. As a newbie to all this, I’m still processing the ideas in Tolle’s book, The New Earth, and I haven’t quite finished reading it. But what I’m gathering so far is that simply being AWARE of our Ego and it’s dirty tricks will improve our ability to be present, and will also help others who are unconsciously immersed in their egoic mind become more present and aware as well. We can observe our Ego react to its need to be better, be right, be strong, be powerful, be more beautiful/talented/richer/smarter/accomplished/virtuous than someone else. Accepting our need to feel that way also paradoxically allows us to diminish that need. Tolle also recommends that the next time we are criticized or blamed, that we do nothing but sit with the discomfort of the criticism. Criticism doesn’t diminish who we are, our essence, by one iota. Yet again, watching and not judging our reaction to criticism allows us to engage with the self / consciousness that is separate from the Ego. Fortunately, I had the opportunity to try this exercise yesterday. I’m not sure exactly of the outcome but feel like I had a little more lightness in my chest afterwards. This will be my challenge for my 6th decade…. (yes, my Ego is reacting to what seems like double counting the early decades), to really get to know my right brain, its wisdom and the bliss that it provides. My left brain has gotten all the attention all these years and it’s time to right that situation. The two hemispheres will also learn how to play nice together and finally learn to work as a team. Who’s with me? I’m struggling with my ego. We all are, really. Our students probably think,” of course you’re struggling with your ego – you’re a professor” with the surprise being that we’re struggling, with, not mindlessly feeding, the ego. I’ve never really understood the difference between the how-important-do-I-feel-ego and the Ego referred to in psychological parlance. It’s somewhat confusing as we can have subjectively a small ego while still being very attached to our Ego. I still don’t understand it fully, but it seems that they’re roughly the same. However, I think the common usage is somewhat more restricted in meaning and scope than the psychological term. Our Ego refers to how the mind perceives itself, regardless of whether it views itself as important and grand or insignificant and small. I am a mother, daughter, friend, professor/teacher and a student of life. I live in a house, with a hybrid car, and I have two dogs. I am a Democrat, liberal/progressive, humanist. I am middle-class, Asian female with a doctorate in pharmaceutical sciences. I have been a scientist, am now more of a educator/administrator. I live in the suburbs in Virginia, in the USA. My most valued possession is my family photos. I prefer to view myself as a kind, smart, capable person who is somewhat unconventional. This is my Ego. My mistake is sometimes believing that this is Who I Am. It is not. Take away any and all of the above and I am still me. The trouble with mistakenly believing these identities as who I am is that I might work hard or even fight, emotionally, physically, and psychologically to maintain those identities. I might spend all my money, spend all my time, have endless and vociferous arguments regarding, might vilify or fight with others, in order to maintain those identities. When I confuse my identity with what I own, who I am, or my roles, then my Ego is attached to something “as a substitute for the Being that it cannot feel.” – Eckhart Tolle, A New Earth. When we cling to these false identities, we are separating ourselves from who we really are and feeling our essential Being. We give away our power by clinging to a false identity. Letting go of our Ego attachments can give us our power back and keep us in touch with our true selves and our human essence. This does not mean that I’m no longer going to try to do/be all of the above. No. This is what I do and what I care about. But if for some reason, one or more of these identities go away, I will grieve, but let go of them. Nothing can take away the essence of the spirit that I am. And that’s power. I’m not sure this is even a real phrase or concept, but I think it accurately describes what is a useful feeling that is often ignored. I know – it sounds like Sylvia Brown or tarot-card reader with indigestion or bunions. And I want to differentiate psychic discomfort from psychic pain, which is non-physical pain that is associated with mental suffering. Mental illness such as depression can cause psychic pain. I’m not talking about mental illness. I’m talking about when we experience discomfort, a nagging feeling in the back of our minds or the pit of our stomach that something is amiss. This feeling comes up when we find ourselves laughing at a cruel joke or a funny prank that could result in a serious injury or loss, when we catch ourselves after the fact saying something unkind, when we cut someone off on the freeway, when we play finders-keepers without trying to find the rightful owner, when we remain silent when we are undercharged at a restaurant, when we don’t tip a waitress because service wasn’t perfect. The list goes on and on, but I’ll bet you can look back on the last few weeks and discover a time or two where you felt this discomfort. Pain is a good thing. It is an adaptive tool that has evolved to make humans change their behavior. Physical pain, such as burns, means that next time we avoid getting too close to the fire. Psychic pain serves the same function. Fear, for example, can help us avoid dangerous situations. Anxiety can help us choose safe behaviors such as driving defensively or avoiding unnecessary risk. I have written several times in the past on this blog* about how we should be careful to not criticize others because that criticism (or those feelings we are accusing others of having) is usually regarding characteristics we hate about ourselves (or feelings that we are having). This very natural, but unhelpful, behavior is called projection. When we project our feelings or self-judgment onto someone else, a part of us realizes that we are creating an injustice that we sense through psychic discomfort. I’m not saying that others are never misbehaving, having hostile or negative feelings, or are always doing the right thing and that we have no right to have concerns about their behavior. I am saying that we, more often than not, have a role that may be invisible to ourselves in the situation we’re complaining about. I might blame someone for losing something (which I may or may not have had a role in) and then feel, on some level, that they’re responsible for my feelings of loss of control, anxiety, or anger, rather than taking ownership of my own feelings. I might decide a colleague is getting in my way and is evil, but feel discomfort when I complain about her because I know that I play a 50% role in our dysfunctional relationship. I might feel discomfort because I know I owe someone an apology (or a tip) and yet I remain silent and do nothing. The trouble with repressing our psychic discomfort is that those unresolved feelings accumulate and escalate. These unresolved feelings could cumulatively result in actual psychic pain, such as depression. We may continue to suffer poor relationships with others because we don’t take responsibility for our feelings and roles in those relationship. We perpetuate and reinforce our feelings of unworthiness, unlovability, and incompetence while hiding behind bravado, arrogance, martyrhood or depression. The more we act against our conscious, the more we confirm to ourselves that we are unworthy and unlovable. So, in the end, we’re only hurting ourselves by not respecting and heeding our better angels. I’m no Sylvia Brown, but I do know that hiding from our pain and discomfort only creates more pain and discomfort. Like a toothache, the more you ignore it, the worse it gets. We have evolved these adaptive mechanisms to grow and improve. Going against our basic nature of heeding our pain, psychic or otherwise, impedes our natural growth and evolution to become a self-actualized person. The good angel inside us is our guide: treasure her wisdom. Doing the right thing and following our conscious, though it might seem harder in the moment, is easier in the end. A good and beautifully-said reminder everyone…. !